I get the above error trying to import the SDL2 library. I'm running 32bit Linux Mint (quantal version), and today compiled and installed the latest SDL2 (2.0.3) from their website (SDL2 is not available in my distros repos), and installed the latest py-sdl2 (0.9.2, tried both versions of installation make and via the setup.py - you never know...) and all those other packages following the instructions on the site. So I think this cannot be due to a 32/64bit incompatibility, which is described as a frequent cause for this error message in the FAQ. How can I go on finding the problem? My best guess is that you suffer from the problem described in issue #48. If 1. solved your problem, either add /usr/local/lib to your ld paths (add it to /etc/ld.so.conf) or run ldconfig -n /usr/local/lib on it. Let me know, if this fixes your problem. I resolved the problem by uninstalling and recompiling SDL2 after configuring with -prefix=/usr, which works. Did the same for SDL2_gfx, which couldn't be found or was deemed to be unusable (strange error message, that...), either. Now I tried all the examples from the examples folder and found that they seem to crash / not render correctly if the example window contains letters/fonts. It either says 'Speicherzugriffsfehler' (segmentation fault, helloworld.py), or where there should be words in the example (gui.py) - at least I think there should be, on the left -- --, there are only funny colored dots and no error message on the shell. Did an extensive Web search and found that SDL2_ttf was also necessary or at least useful, and thought that maybe its missing caused the segfault/render issue. Configured this again with prefix=/usr, and compiled and installed. Unfortunately, this was not the solution... still getting segfault and funny colored pixels, screenshot attached. Put it into Eric, and found the helloworld.py crashes after spriterenderer.render(sprite). So at least this is not caused by any fonts. And in the picture for gui.py, it fails to render the bitmap images correctly, the functionality is good (if I click on the left bottom text input field, I get the text I input in the console, the button clicks are recognized, the checkbox changes color on click). The pictures are available and the files are not broken. When it breaks, type bt to acquire a backtrace with (hopefully) more information about the source of the segfault. After reading 'along with SDL2_image...', it dawned on me that there might be another library missing, because I was sure I had not installed that. Installed it now and - voilà - it works. No segfaults and 'beautiful' buttons. So now I have _image, _gfx, _ttf and the basic stuff which comes with SDL2 source. Do I still need further libraries of which I don't know yet that they exist? (Maybe one out of _mixer, _Cbs, _rtf, _net?) EDIT: need _mixer. I'm really a noob in this. Could you make pySDL2 check if all the libraries are installed before you allow it to start or make it give a warning that this or that will not work until this or that is installed? And / or could you add the full list of requirements to the documentation (if they are not there and I just missed them...EDIT: I did misunderstand the list, thought all was really optional for me, but I needed it. See post below.)? Would you also add a hint for Ubuntu/Mint users on configuring with --prefix=/usr or adding that directory to that ld-config file to avoid the issue of not finding 'usable' libraries? Anyway, this Linux Mint bug(?) isn't your problem..., Thank you very much for your help! Now I can finally start my little game :-D ! Great to hear that you tracked that issue down. I'm somewhat surprised that the examples misbehave in such an unpredictable manner, if SDL2_image is not around. I'll recheck the code to issue warnings or errors instead of crashing. SDL2_image is only necessary, if you want to use non-BMP image formats. Alternatively, PIL (the Python Imaging Library) can fill that gap, if installed. SDL2_gfx offers more advanced graphics primitives that SDL2's Renderer does. Any of those however should be completely optional and the SDL2 internals should fail with a clear error message, if the libraries are not installed. 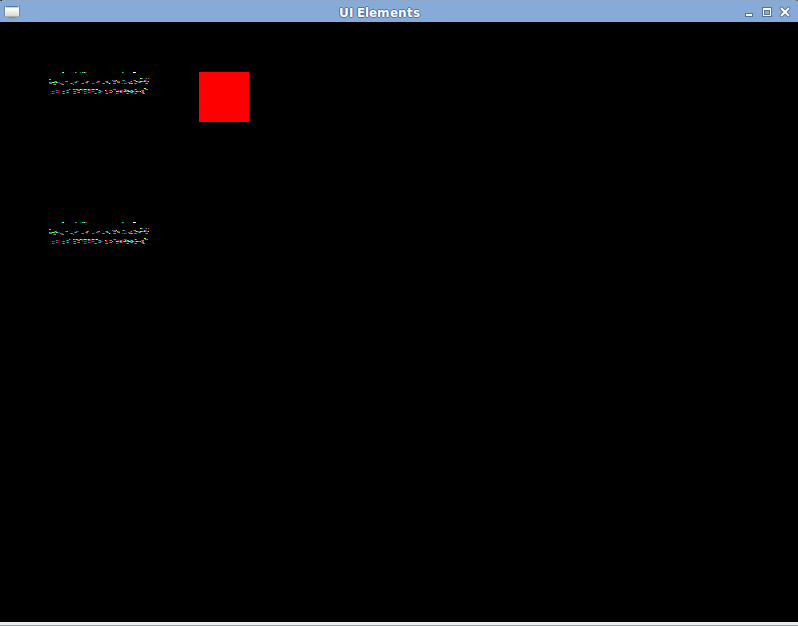 As written above, this does not seem to happen properly at the moment (for SDL2_image) and I'll investigate this.